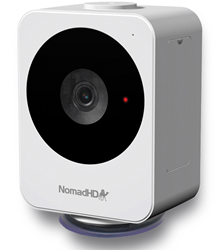 NomadHD, designed for temporary surveillance needs, is a high-performance 2MP video camera with its own rechargeable battery, WiFi/4G modem/SD card, and can be easily mounted on any smooth surface without any tools. The updated model is smaller and delivers superior performance. Just like its namesake, the NomadHD camera 'sets up camp' and is completely self-sufficient, even without access to power. IPVideo Corporation, manufacturer of IP-based video surveillance and command center solutions, introduces a redesigned and improved NomadHD™ – a high-performance 2MP video camera, rechargeable battery and WiFi / 4G modem / SD card within a compact custom housing, designed for easy installation on any smooth surface without the need for tools. The camera can be deployed in seconds, providing immediate, temporary surveillance video. The updated design is 50% smaller than its predecessor, and features 2-way audio, expanded mounting options and longer battery life. Its presence can serve as a theft deterrent as well as a forensic tool for a wide range of applications, including the monitoring of cargo holds, freight handling, crime scenes and building renovations. The camera’s rechargeable battery can operate for up to 8 hours per charge. An impact resistant and weatherproof housing allow for deployment indoors and out. A lockable on/off switch prevents on-site tampering. The NomadHD may be used in conjunction with the SentryVMS video management system, which provides highly secure, easy access to live and recorded video from computer workstations or mobile devices. A single SentryVMS server can support a large number of NomadHD units, making it an ideal tool for Port Authorities, law enforcement organizations and other security management teams responsible for monitoring multiple, frequently changing locations. The NomadHD may also be used with many third-party VMS solutions, and can also record directly to the camera’s local SD card. See the NomadHD on display at ISC West in Las Vegas, April 6-8, booth 19116, and within the SIA New Product Showcase at the event. Visit http://www.ipvideocorp.com for more information on the NomadHD and other security solutions.